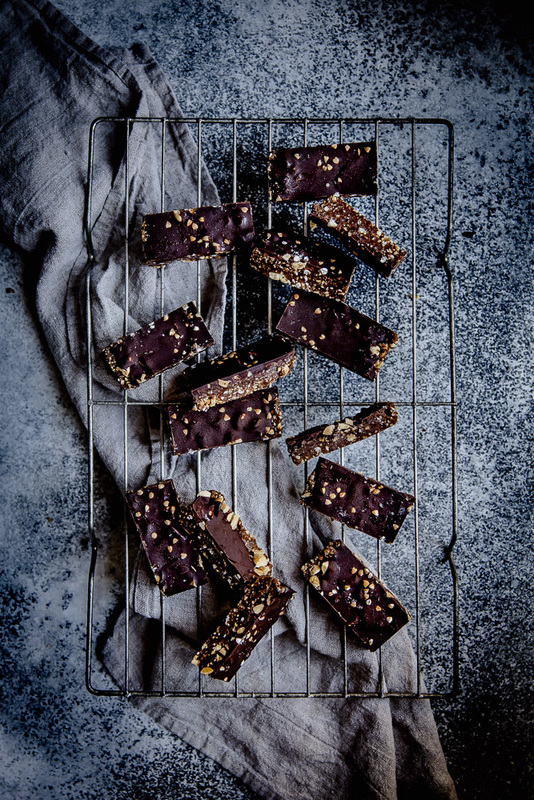 I am not at all embarrassed to admit that I’ve made three batches of the Peanut Butter Caramel Crunch bars from Freya’s Nourishment since I first discovered them two weeks ago. Not only are they delicious, they are super simple to make, and contain only four ingredients (five if you add the mesquite powder, which I didn’t). The first time I made them, I stuck to the recipe exactly. I love the combination of peanuts and chocolate, especially with a sprinkle of salt, so these were right up my alley. Even though they were a huge hit, I immediately started thinking of ways to adapt them – which is usually how my brain works when I cook! It’s not necessarily a case of making things better all the time, but more so seeing if I can come up with a different flavour combination that might also work, just to mix things up a bit. Last year I tried a cardamom tahini cookie that was DIVINE, and I’ve been wanting to try these flavours together again ever since. So when Kristie (aka @freyasnourishment) mentioned that she had tried tahini in the bars, ideas started racing around my mind. Kristie stated that while they tahini version was good, she preferred the peanut version, which didn’t surprise me too much as tahini can be a really strong flavour. So I decided to use part tahini/part nut butter in my version. And of course, cardamom, the star flavour. 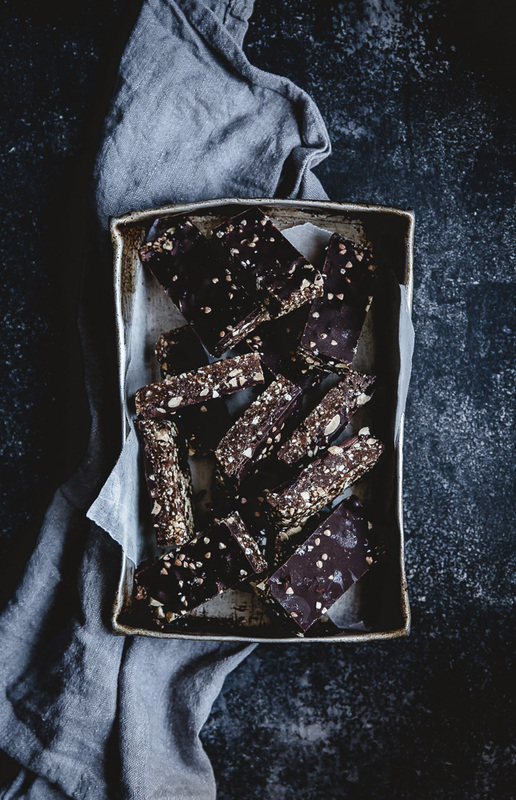 I was a little nervous at first – cardamom is a strong flavour, and I was worried I may have ruined a perfectly good batch of chocolate peanut bars but adding it in, but the end result was something really special. If you’re a fan of cardamom like I am, you must give these a go! These bars are extremely adaptable. 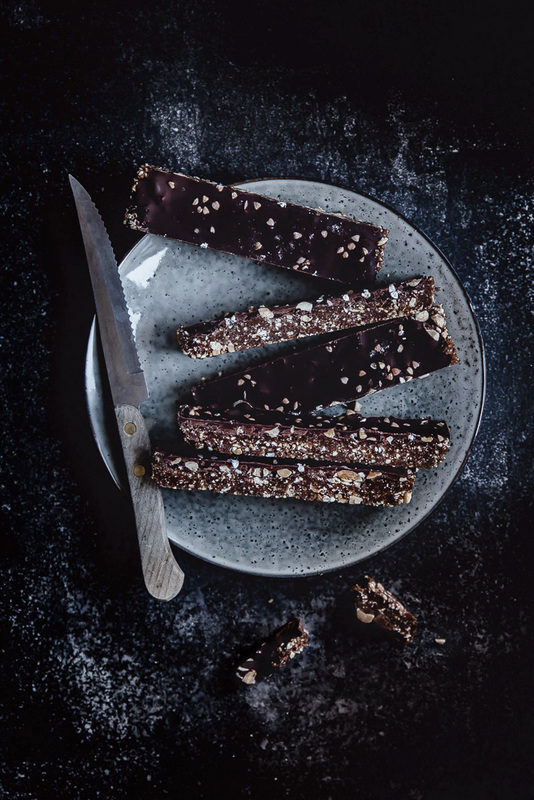 You could try different nuts and nut butter combinations, swap out the cardamom for another flavour (cinnamon, ginger etc), or add in as many extras as you want – dried berries, coconut, cacao nibs, seeds – the options are endless! And if you’d like to try the version that got me hooked in the first place, you can do so here. Add the first seven ingredients to a blender and mix until well combined. You can keep mixing for a smoother texture, or process until just combined for a crunchy texture. Pour into a small, lined loaf or baking tray and flatten down. Place in freezer while you make the topping. Break the chocolate into smaller pieces and place in a small saucepan over the lowest heat. Stir constantly until melted. Remove the tray from the freezer, and pour over the chocolate, smoothing out with the back of a spoon. Sprinkle the buckwheat, nuts and salt flakes evenly on top, and then return to the freezer to set (around one to two hours). Once set, remove and cut into small bars, and then store in an airtight container in the fridge up to two weeks. Oh yummo! I need these right now! Looks delicious! Do you think I could use something in place of the buckwheat and the peanuts? I’m doing a paleo diet. Thank you!! 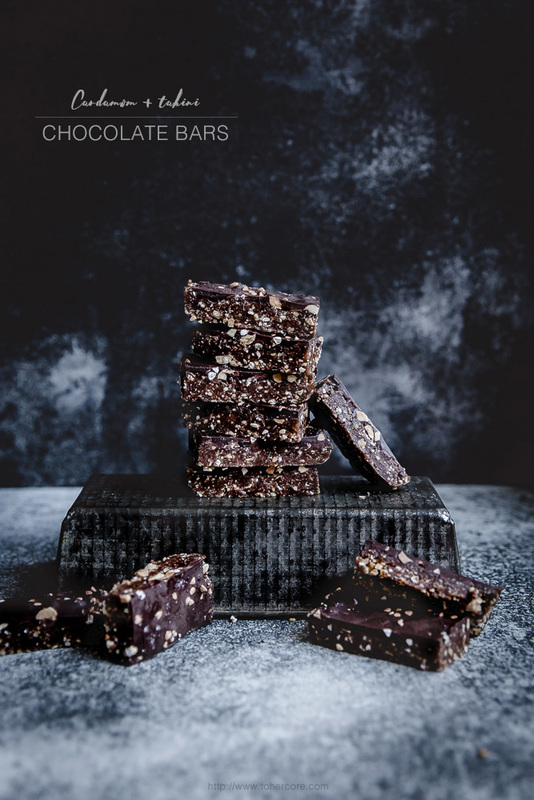 I just made these but completely forget to add the cocoa (I don’t have any cacao) powder. I hope they turn out alright. I love cardamom and dark chocolate but I’m not so obsessed with the chocolate and peanut combination as everyone else seems to be. I left out the salt as I hate the salty after taste of ‘salted’ chocolateamd caramel. The buckwheat I used was just uncooked kasha, because I had it on hand, and it’s a lot finer than in your pictures so it may not all stick to the top (I used 2 tbsp each of crushed peanuts and kasha).